"I create images, ideas and teachings through a traditional method of painting with brushes on stretched canvas." Some of these paintings are a bridge footed within post-modernist art making and stretching towards a future communication that has not yet seen its fruition. These paintings hold divisions and disections of the various realms of existing, taking essential ingredients from these different levels and splicing or blending them to form new patterns, creating a mind shift extending to the outer side of our sense perceptions. 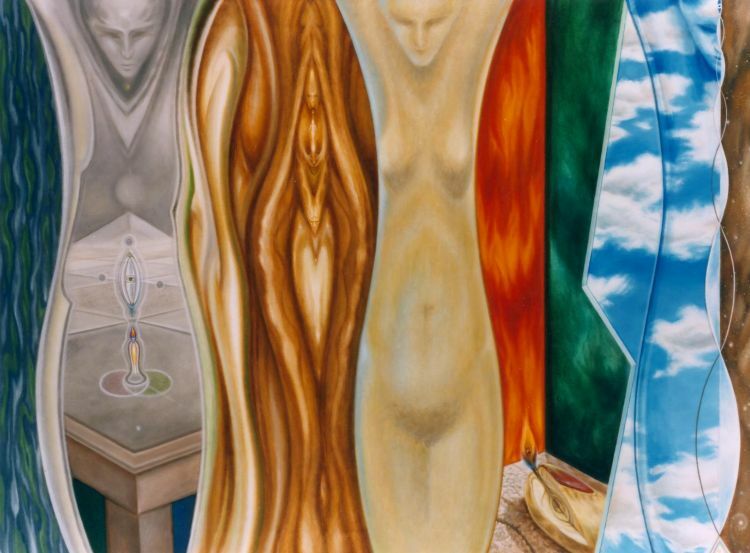 Some of these paintings are an exploration into the reaches of my inner sanctums - windows into the various levels of my soul, brought out through the divine in us all.
" I am not only me, but you are me as well. I am you. We are all human beings. We all share the divine light and energy of life properties.
" I am carrying the torch of my heart, a beacon to our soul nature in showing the inherent right to our incredible minds and the energies generated by the body." As each of these paintings are portraits of the various aspects of my SELF, remember that they are brought upon by the spark of inspiration from my soul, reflecting the people and surroundings, past and present and future that have encompassed my presence here. Each painting carries a vibration from it's original conception through collected energies transmitted out by my movements. The blending and combinations of color will set off subconscious mechanisms that could unfold the gateway to YOUR inner sanctuaries. These works hold a fusion of my reality and everyones fantasy. They are explorations in an attempt to understand and explain to people in visual dialogue what I see, feel and think is going on around me. I have always felt that I didn't belong here and that my home was somewhere else. I feel a great connection to the cosmos. I have a hard time here on earth and it is a struggle to understand its workings. I suppose, in order for me to cope with this, I often engage myself in visiting the other world, exploring it's ideas through my imagination and intuition. I have strong roots in Surrealism.